Now a fifteen-year-old Rotorian girl has learned of the dire threat that Nemesis poses to Earth’s people—but she is prevented from warning them. Soon she will realize that Nemesis endangers Rotor as well. And soon it will be up to her alone to save borth Earth and Rotor as—drawn inexorably by Nemesis, the death star—they hurtle toward certain disaster. This is a novel that Asimov wrote to give himself a break from the Foundation and robot novels, but I can’t say that I regard it very highly. First of all, he gives it one of these complicated structures—writing the novel from three different points of view, and from three different time-frames—which he tends to like so much but which never really works for me. 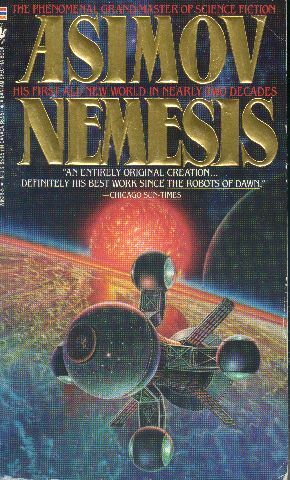 The social background of the story and the science are generally interesting and Orson Scott Card was right in his review of this book to call it a “page-turner.” These are features common to many of Asimov’s later books—stronger backgrounds with weaker characters—and Nemesis is less interesting than it might have been as a result. Beyond that, on the whole, it simply feels bloated and unnecessary. It is not one of the high points in Asimov’s literary career.